« Bob Benson, Arsenal player with a great sense of humour, who died playing for the club. 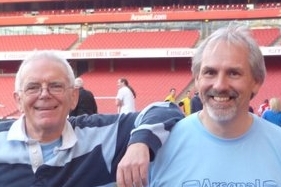 I am breaking off from the series of articles on the very last Woolwich Arsenal match because I have received really interesting information from the Norwich supporters site “Sing Up The River End!” run by Andrew Harrison. If you are an avid follower, you will know that we’ve determined that the name Woolwich Arsenal FC changed to The Arsenal at some time between 20 and 23 April 1914, as revealed by the details on the programme. See the article on how the name of the club changed for full details. Anyway, Andrew drew my attention to the Norfolk and Norwich Hospital Cup match of April 30 1914 in which The Arsenal played Norwich City and won 3-0. Now we know from the programme for the final home game of the season against Grimsby on April 23rd 1914 we were then officially The Arsenal, having played every other home game of the first season at Highbury as Woolwich Arsenal FC. “Firstly, my point of reference was a book called Canary Citizens by John Eastwood and Mike Davage and it definitely states it was Woolwich Arsenal who contested the Norfolk & Norwich cup on the 30th of April 1914. This book really is the bible of NCFC history (which I acknowledge on SUTRE!). It was published in the mid eighties and more importantly the authors had access to official club records/ handbooks etc (which I don’t). “This date is of course contrary to the date you have for Woolwich Arsenal’s last game under that name. My best guess (and it is only a guess) is that NCFC would not have made any attempt to change the title of the fixture – it was after all an unofficial match, and for charity – and it would have been important to the folk of Norwich to know the real Arsenal were coming to the city. I doubt Arsenal would have had any particular feelings on the issue either. But certainly as far as us lot up here in Canaryland are concerned, our historical records very clearly state Woolwich Arsenal. As it happens I can’t do anything about the Norwich team, but I can give the Arsenal team – which we can compare with the team that played the actual final game as Woolwich Arsenal FC – the second division game against Clapton Orient. I wonder, and it is an utter guess (Andy will probably put me right tomorrow) if Henry Norris had applied to change the name of the club from the moment we moved to Highbury, but had to wait for official approval before it could be put on the programme. A shareholders’ meeting perhaps (although he was the dominant owner he still had to have official meetings). Or maybe our old pal Jack Humble kicked up a fuss and argued in favour of keeping the traditional name of the club. Or maybe it was a Companies’ House thing. Anyway, the official name change was there as we’ve said, but that never stops people calling a club anything they like, and as I have noted before supporters of other clubs (and possibly Arsenal) kept up the name Woolwich for years. Indeed Tottenham fans still do (although they have always had a little difficulty with contemporary events). “I saw an item on your site regarding Thomas Fitchie. Again my thanks. Another little bit of info for the book. If you have read this, you must read this: Making the Arsenal: available from Amazon.co.uk but for a signed copy dedicated to whoever you want just order from the publishers (follow the link) and add details of the dedication wanted to your order. You’re going to hate me for this. The club announced the name change in The Times. It looks like the last game as Woolwich Arsenal was against Stockport County on 13 April 1914. The team line-up was exactly the same. OK Andy I will just have to do a rewrite – but having started the Clapton Orient series I will finish it! Interesting in that article you cite the bit about Leitch. If you have ventured into my book Making the Arsenal you will know that Leitch figures there quite extensively, and the behaviour of Leitch lying low would be very much along the lines of his earlier behaviour. What we have is a name change, on a formal date, but the club being slow to pick up on it in its own programme. I suppose the printer took a bit of time to change the plates! Excactly my thoughts about the printer. In those days I think maybe the printer did not have the time to change the plate they used all those previous games and they just used what they got for the next match. And then went on to change it for the folowing game.